You know Dasher & Dancer and Prancer & Vixon, Comet & Cupid and Donner & Blitzen. But do you recall the most famous reindeer of all! Rudolph the red nosed reindeer....one of my favorite songs and characters during the holidays. Rudolph themed lunches are easy to create, all you need a circle or heart shaped cookie cutter, it's quite simple and fun. You can find some of my past Rudolph themed lunches HERE. 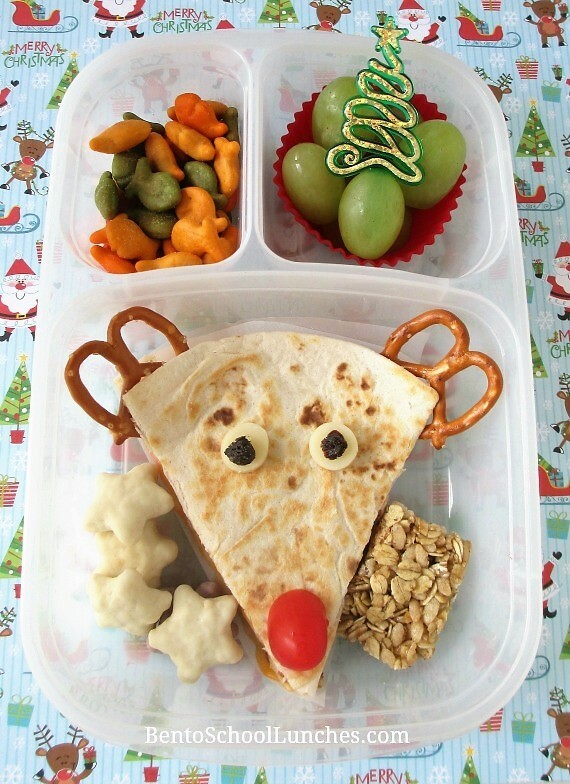 I have made a couple of Rudolph themed lunches this year, one is with quesadilla and one with bread. This first lunch is Rudolph made of bread with a circle cookie cutter. I added a couple of pretzels for antlers, icing eyes (secured with a dab of honey) and half of a grape tomato. Kind of looks like Rudolph as a youngster perhaps? 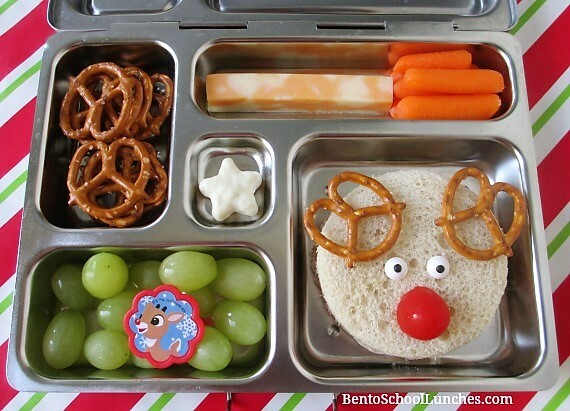 In this bento lunch (packed in a Planetbox rover): Main compartment contains a Rudolph sandwich, sides were green grapes with a cute Rudolph cupcake ring, pretzels, yogurt covered star, string cheese and organic baby carrots. In this bento lunch (packed in an Easylunchboxes): Main compartment contains Rudolph quesadillas (stacked), half of a granola bar and yogurt covered stars from Trader Joe's. Sides were goldfish crackers and seedless grapes in a silicone cup with a Christmas tree cupcake pick. I love these ideas, so creative! Cute and fun lunches!